I Have a Dream...and Now is the Time! One of the phrases King used multiple times in this speech that is not quoted as often as, “I have a dream,” is “Now is the time…” This is a phrase that every individual, team, and organization must continually be considering. What important actions are you delaying that you know in your heart and soul should be addressed right now—regardless of how difficult they might be? We can have a tendency to procrastinate, and then rationalize our procrastination. But as Dr. King so emphatically encouraged, we must feel compelled to act now when an issue needs attention. Almost like a mantra, we could start each day with, “Now is the time.” Now’s the time to tell those you love how much they mean to you. Now’s the time to start taking better care of yourself. Now’s the time to apologize for a wrong you’ve done, or forgive a wrong done to you. Now’s the time to provide the leadership you know is needed, regardless of how uncomfortable it feels or what repercussions you may fear. Early one misty Martin Luther King Day, I was driving on the only road through a very conservative rural town. I could barely believe my eyes when I saw a large banner displayed across the front of a pub bearing the hand-written words, “Dr. King, We Share Your Dream.” To share King’s dream means to act now, as the owners of that pub so courageously did. What have you been putting off that you know needs to be addressed now? Find the strength to do it, and fulfill your own dreams. Labels: I Have a Dream, MLK Jr. I seem to be continually amazed at how a few commitments among a group of people can be transformative, resulting in greater harmony and productivity. One of my clients, The American Coalition for Clean Coal Electricity (ACCCE), recently decided to give their organizational culture a jump-start in aligning with their values and business goals. They chose 3 behaviors that research has shown to exist in constructive cultures and agreed to practice these with one another. In a few short months, you can feel the shift. When interns and new staff members join, these 3 behaviors are shared with them, so they know what to expect of others as well as what is expected of them. Rather than creating a long list of do’s and don’ts, they found that zeroing in on just a few key predictive behaviors was enough to shift their culture. Their success reminds me of an event I witnessed and have discussed many times, because of its impact on me. Dining at the home of friends whose daughter had just come home from Kindergarten, we were asking her about her day at school. In her dramatic tale, she mentioned another student, whom she described as, “stupid.” Both her parents took immediate notice, then calmly told her that, although others might use that word, they were “Bakers,” and members of the Baker family never called anyone stupid. They continued throughout her childhood to gently yet firmly reinforce and model behaviors that they felt embodied their family culture, and to forbid those that they believed didn’t represent their values and beliefs. Their daughter, now in college, embodies the qualities they intentionally nurtured in her—kindness, cooperation, reflection, and generosity. Try this in your own family, team, or organization. If you need a list of constructive behaviors to get you started, contact me and I’ll email you a list. I’ll bet you already know some obvious behaviors to encourage as well as some to eliminate. You’ll be astounded at the mutual trust and respect that blooms when you agree upon and intentionally practice positive behaviors. 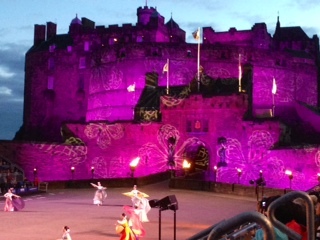 Harmony through Diversity at the Edinburgh Military Tattoo--and the world's second most sung song! On my recent visit to Scotland, I had the opportunity to experience the Edinburgh Festival and attend the Royal Military Tattoo, with the castle as its backdrop. While we heard plenty of the bagpipe bands marching in rows that I expected, I was surprised by the range of dance, vocal, and performance groups from Mongolia, Mexico, Korea, New Zealand, and other parts of the world. This diversity led to a rich, vibrant harmony, culminating in all the performers coming out together and joining the audience in singing the second most sung song in the world, Auld Lang Syne. Their custom is for people to cross their arms and clasp hands with those on either side of them, swaying to the song--quite a sight with this wide a range of participants, many of whom were enthusiastically swaying and singing in English, a language they don't speak. Whenever you get stuck in your life or your work, a way of breaking through to a deeper solution is through diversity--either expand the definition of the problem you're facing or expand the size and diversity of the group addressing it. The Royal Military Tattoo was a spirited reminder of how diversity can often open doors to innovation, growth and harmony. 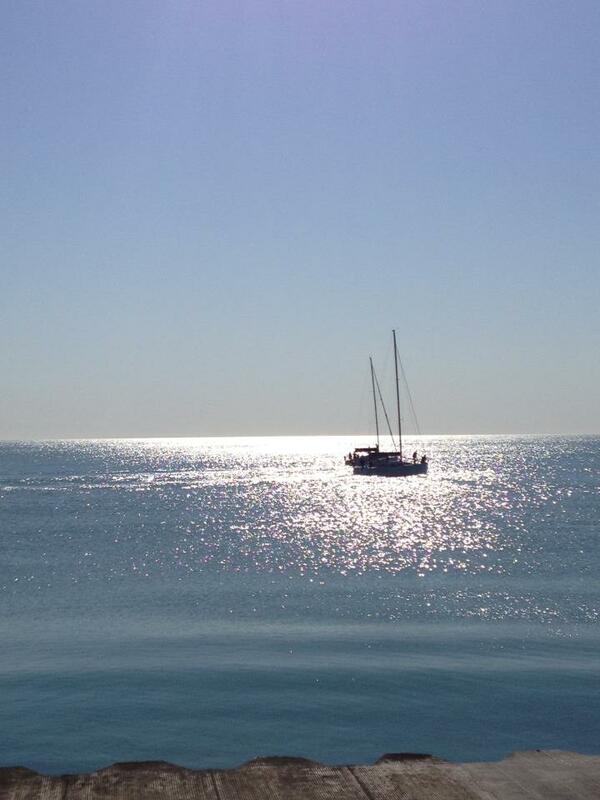 Everyone who has ever sailed knows the feeling of exhilaration when their sails are trimmed perfectly. You can literally hear and feel a sustained note in the rigging that could well be described as a hum. What a thrill—one I had recently while sailing my San Juan 21 on the Chesapeake Bay on an unusually windy day for this time of year. As I enjoyed the pleasure of flying over the water, I couldn’t help but reflect on the similarities between sailing and leading an organization. Sometimes conditions require a light touch, while other conditions demand a stronger hand. Usually, you can’t sail directly to your destination—the fastest route involves keeping the destination in mind while tacking back and forth as you move toward it. The cooperation among captain and crew is also critical, affecting timing, speed and safety. Nature moves toward greater purpose and harmony. When we accept the organic way in which change occurs and work with nature, we are more successful than when we ignore or fight it. Sailing is such a good reminder of this, as well as a great metaphor for leading organizations. Whatever summer pleasures you undertake in this next month, do so with greater purpose and harmony—and bring back to your workplace whatever insights they provide.